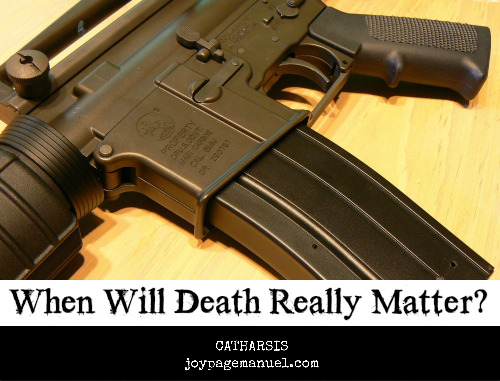 CATHARSIS: When Will Death Really Matter? Yesterday, I was at my son's school for an event. All the students, teachers, staff and parents were in the gym until at some point, the principal had to dismiss all the second graders so they can prepare to go on their field trip. I watched from the side as these adorable 7- or 8-year old kids stood and quietly walked out the door in their color-coded shirts. Then something happened to me, something I've never felt before given such a mundane situation. My breathing felt labored. Sadness first took over, as if I wanted to cry and hold all those children in my arms. And then the anxiety, as if feeling claustrophobic and needing to step outside. I had to force my brain to think rationally and calm myself down. Fortunately, the sensation left my body only after a few, manageable seconds. It was pure fear triggered by the recent mass shooting in Las Vegas—59 dead and at least 500 injured. Once again, we find ourselves engaging in discussions about gun control. It's absolutely necessary though undeniably frustrating that we have to be in this situation yet again. Every time incidents of gun violence surface, we clamor for changes. We donate, sign petitions, call, text and tweet to our representatives hoping they would listen to perfectly rational arguments in support of commonsense gun control measures this nation desperately needs. Honestly though, part of me feels hopeless because I ask—If they never listened when our innocent, beautiful children died in Sandy Hook Elementary, if they were not moved enough by the images of those powerless six and seven year old children being slaughtered—then what would? And what makes me think this time it would be different? What would it take for our lawmakers to stop selling their souls to the NRA? Don't think for a second that the NRA is doing anything heroic this week by announcing its support for banning 'bump stocks': a gun attachment that converts a semiautomatic rifle into an automatic / machine gun, the same type used by Stephen Paddock, the Las Vegas shooter. Banning an attachment is not gun control by any means. To me, it's another a**hole move much like when someone thinks he's helping a 'country' that has no power, fuel and food by throwing paper towel to a desperate crowd. Yes, I hate the NRA with a passion. They would do anything and spend millions of dollars to block any legislation that would close loopholes in existing gun control laws. They have also asserted themselves in blocking research on gun violence which is of course necessary if any lawmaker is to push for new legislation with regard to gun ownership. I hate that the NRA preys on conservative gun owners by selling them the false idea that to push for stricter gun laws is the same as taking your guns away from you, even as you are a responsible gun owner. I hate that profit speaks louder than all the lives lost through senseless gun violence; that greed seems more important in our society than the gift of healing we can offer those who continue to suffer because they have lost loved ones in the hands of a mad man, a domestic terrorist. I don't want school staff and students to carry guns in schools and campuses. I don't want guns in bars and restaurants. I don't want those on the terrorist watch list to have access to guns. I want everyone to go through a rigorous background check if they are to purchase guns. And I certainly don't want assault weapons to be sold to civilians. These types of weapons are solely meant for killing as many people as possible in the shortest amount of time. They are not necessary for recreation, nor simple self-defense. All of these beliefs I hold dear, the values I allude to in the aforementioned desires, are the same ones that the NRA have relentlessly attacked and worked hard to kill in Congress. So yes, I hate the NRA with a passion. And this is why this is an issue I will continue to fight for in spite of my humble means...because I cannot continue being hostage to my anxieties every time I see crowds...because I know my prayers are not enough to keep every child out there safe from trigger-happy monsters. I could not agree more with every single word of it. When is it going to be enough? When you are at university, I bet that you need to write a gun control essay - that is one of the most discussing topics in USA, that's why, I recommend you to focus on it and prepare well.